In November 2003, Fender made the announcement that 100 Stevie Ray Vaughan “Number One” replica guitars would be made by their Custom Shop (all by John Cruz), priced at $10,000 each. A few months before, Fender (with Stevie’s brother Jimmie overseeing proceedings) were able to get a hands-on look at the original instrument, with the goal of painstakingly matching every minor element of the famous guitar using detailed photographs and video which an be seen in the clip below. Sometimes also referred to as the “First Wife”, Stevie acquired the guitar in Ray Hennig’s Heart of Texas Music in Austin which he allegedly traded for a 1963 Stratocaster. “Number One” consists of a 1963 body fitted with pickups taken from a ’59 and 1962 neck which has an unusually thick D profile that clearly suited SRV’s unique approach to playing. Over the years, “Number One” has undergone several changes, a few accidents, and even some abuse which have given it it’s unique characteristics. The original white pickguard was replaced with a black one which Stevie also glued his initials to, and a lefthand vibrato system (inspired by Jimi Hendrix and Otis Rush) was also installed. The completed guitars debuted at the winter NAMM show January 15-18, 2004. Although they have serial numbers, they are not serialized 1 through 100 as each guitar John Cruz makes, regardless of model, receives the next serial number in line. With the first numbered as JC044 and the last JC229. Today these Cruz Tribute Stratocasters have more than held their value, with some recent reported sales having reached up to an incredible $50,000 price tag. So Stevie “s guitar is now Jimmies? It would have been Great too here Jimmies take on it in this video . A REAL piece of history there ! Love to watch the video “s of the two of them playing together . At around the same time, Mike Eldred from Fender CS was commissioned to make exact measurements of Jimi Hendrix Woodstock white strat. He then built 4 exact clones of it. 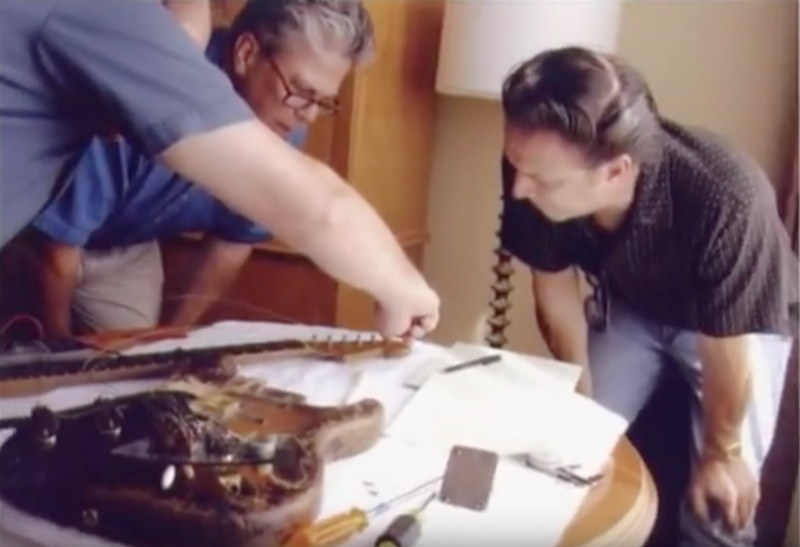 A video was made of the original guitar inspection by the Fender luthiers. I’d love to see it but I don’t know where to find it. Did all of Stevies strats have a lefthand whammy bar set up….?? Stevie ray and #1 were perfect Couple. Can only imagine how much of stevie was running through Jimi hand and body when touch it for 1st time..l I got goose bumps when saw jimi setting in the chair with it.